An opinionated, stimulating account of how classical music failed to establish fruitful roots in America . . . Unlike most lengthy texts, this one gets better as it progresses, drawing complex themes and a huge cast into a single overarching vision of a cultural attitude that has produced many fine artists and striking moments –but no institutional or intellectual support to sustain them. This knowledgeable, well written history throbs with life. . . . Every story and quote serves the author’s larger interpretive purposes. Joseph Horowitz cares deeply about classical music and its fate in America, and he assesses some of the more disturbing post-1920 trends with a critical but never a cynical or despairing eye. Avoiding the narrowly parochial, he embeds his story within the larger framework of U.S. social and cultural history. This major work of scholarship is also a delight to read. The rise and fall that Joseph Horowitz brilliantly describes here brings life and shape to an arena of American music, and music in America, that has hardly seemed capable of such reconstruction. Through historical research, artistic understanding, human empathy, and shrewd critical perception he has identified a cast of heroic figures who managed to enlist "the queen of the arts" in our nation's democratic adventure. Perhaps the most vivid historical writing proceeds from personal engagement. The genesis of Joseph Horowitz's magisterial survey ultimately dates from his realisation, at college, "that there was something incongruous about being at one and the same time an American and a passionate devotee of classical music." Since then, as author and adviser to leading orchestras, he has tried to relate the artistic heritage of the old world to the restless, uncharted territory of the new, and this volume sums up a lifetime's reflections and frustrations. . . . As a comprehensive, convincing analysis of the contemporary dilemma, and a riveting portrait of the century and a half of events and personalities which brought it about, Mr Horowitz's account would be hard to beat. A narrative that fascinates, intrigues, saddens and, ultimately, offers hope. . . . Nothing less than an epic of historical and critical writing . . . A splendid read, at once disturbing and illuminating . . . virtuoso feats of artistic observation. The summa of Horowitz’s work, the outcome of years of research compacted into a single, seamless volume. . . . He managed to put an eventful 150-year history into a tight narrative . . . Nobody else offers a more cogent explanation of the most pressing question plaguing the entire classical music industry: What happened? Anyone seeking to understand why American classical music has come to so dead an end –and wondering how it might yet escape a final descent into cultural irrelevance –should read Classical Music in America with close attention. 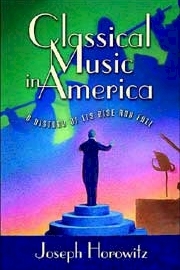 This is a remarkably deep and thorough study of the history of classical music in America. It examines and reports on the art and the business, but more importantly it exhaustively scrutinizes the place that classical music has held in American society -- and the many changes in that place, and in that society, over time. Everyone who has any interest in classical music and its future in this country, whether that is the interest of a professional or a music lover, must read this book and must absorb its lessons. Joseph Horowitz's theme is nothing less than a sweeping examination of how a peculiarly European art form, classical music, was received into the New World and made to obey the demands of a peculiarly American institution, mass media. All the familiar stars are here, from Mahler, Caruso and Toscanini to Heifetz, Bernstein and Van Cliburn. But we see them afresh, through the lens of a society driven by marketing principles and the cult of personality. Whether you agree or not with the "sunset" implications of the book's title, you will be hard put not to see in Horowitz's accomplishment a significant contribution to American cultural history. The story of our symphony orchestras and conductors, of our operas houses and singers, of our soloists and chamber ensembles is a history of our continuing preoccupation with performance, at the expense of composers and the music itself. Joseph Horowitz's newest book, beautifully written by our most accomplished writer on the concert life of the United States, is a must for all who care about music. No one who knows Joseph Horowitz's previous books will be surprised that Classical Music in America, wide-ranging in ambition and scope, is informed, passionate, personal, opinionated, willing to run the risk of being wrong-headed--in sum, all the things a true enthusiast would wish a book on music to be. Horowitz also asks the critical question: do we really love music (as distinct from hyperventilating over highly touted performers), and his answer is not comforting. –Michael Steinberg, author of The Symphony: A Listener's Guide, The Concerto: A Listener's Guide, and Choral Masterworks: A Listener's Guide.